Manchester City celebrated their Premier League victory over Huddersfield with David Silva's son Mateo, who had spent five months in hospital after being born prematurely last year. 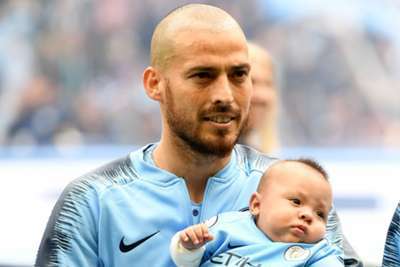 Midfielder Silva missed eight Premier League games after Christmas in the previous campaign while his son was fighting for his life in Spain. Mateo was only allowed to return home in May and he was in attendance for Sunday's 6-1 thrashing of Huddersfield when Silva scored from a direct free-kick on his 250th Premier League appearance. Silva had carried his son out onto the pitch prior to kick-off and he was in the dressing room afterwards as Pep Guardiola's side toasted a comfortable victory at the Etihad Stadium. "He made an outstanding performance," Guardiola said of Silva. "Of course, he was so motivated because his family, parents, and his wife, and especially Mateo, is here. He scored an amazing goal for him. "His son will never forget the first time he saw his father playing football, he could score this outstanding goal. "We met [Mateo] two days ago, now he was in the locker room with all the squad, the family was there. It was a big moment for us. "Last season was a tough moment for his family, and fortunately he fought a lot, the little boy, and he's here. It's a special day for them, for us, for David."